This August, Ontario Parks is challenging you to spend 30 minutes in nature for 30 days, will you take the challenge? This was created by the David Suzuki Foundation, to get you outside and enjoying what nature has to offer! The 30 minutes you spend outside could be anything you want! From going for a run to just sitting out and listening to nature. 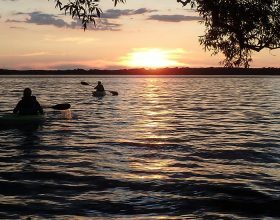 There are so many great ways to enjoy and experience the nature in Ontario’s Lake Country! Here are some ways Ontario’s Lake Country can help you complete the 30×30 nature challenge this summer! Going to a beach or park is a great way to spend some time in nature! Couchiching Beach Park in Orilli a gives endless opportunities for you to spend some time reading a book, doing some art, listening to nature or even having a picnic with friends or family at one of the picnic tables! 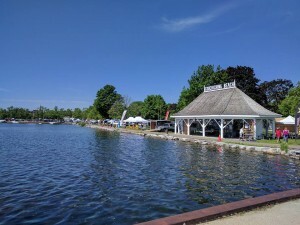 Ontario’s Lake Country also has some great Provincial parks such as Mara Provincial Park, Bass Lake Provincial Park and more that offer so many opportunities to spend time enjoying nature! 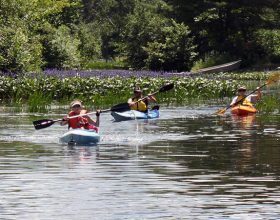 Paddling through the waterways and enjoying the amazing scenery through the region is another great way to enjoy nature for 30 minutes each day! 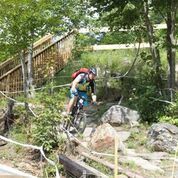 Business such as Hardwood Ski and Bike, and the Scouts Valley Loop Trail provides you with amazing trails for cycling, hiking or walking while experiencing the nature around you! Bring your dog for a walk, family, friends, and enjoy a nice stroll through the trails throughout the region! A New Site-Specific Sculpture Installation will be on display at Grant Woods. There will be 6 professional artists from the region creating natural and temporary sculptures that will be on display until the fall. Art based on nature is a great way to experience it and spend some time enjoying it! There are also m any locations and businesses that want to help get everyone more connected and spending more time with nature such as Wye Marsh. There is 3,000 acres of wildlife area to explore by paddling, cycling trails, walking and many educational displays! Get outside this August and complete the challenge! Spend lots of time and enjoy the nature that is right her in our area!